Herbicides ( US: /ˈɜːrbɪsaɪdz/, UK: /ˈhɜːr-/), also commonly known as weedkillers, are chemical substances used to control unwanted plants. Selective herbicides control specific weed species, while leaving the desired crop relatively unharmed, while non-selective herbicides (sometimes called total weedkillers in commercial products) can be used to clear waste ground, industrial and construction sites, railways and railway embankments as they kill all plant material with which they come into contact. Apart from selective/non-selective, other important distinctions include persistence (also known as residual action: how long the product stays in place and remains active), means of uptake (whether it is absorbed by above-ground foliage only, through the roots, or by other means), and mechanism of action (how it works). Historically, products such as common salt and other metal salts were used as herbicides, however these have gradually fallen out of favor and in some countries a number of these are banned due to their persistence in soil, and toxicity and groundwater contamination concerns. Herbicides have also been used in warfare and conflict. Modern herbicides are often synthetic mimics of natural plant hormones which interfere with growth of the target plants. The term organic herbicide has come to mean herbicides intended for organic farming. Some plants also produce their own natural herbicides, such as the genus Juglans ( walnuts), or the tree of heaven; such action of natural herbicides, and other related chemical interactions, is called allelopathy. Due to herbicide resistance - a major concern in agriculture - a number of products combine herbicides with different means of action. Integrated pest management may use herbicides alongside other pest control methods. In the US in 2007, about 83% of all herbicide usage, determined by weight applied, was in agriculture. :12 In 2007, world pesticide expenditures totaled about $39.4 billion; herbicides were about 40% of those sales and constituted the biggest portion, followed by insecticides, fungicides, and other types. :4 Smaller quantities are used in forestry, pasture systems, and management of areas set aside as wildlife habitat. 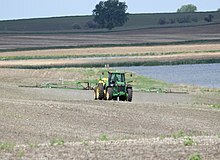 Prior to the widespread use of chemical herbicides, cultural controls, such as altering soil pH, salinity, or fertility levels, were used to control weeds. Mechanical control (including tillage) was also (and still is) used to control weeds. When 2,4-D was commercially released in 1946, it triggered a worldwide revolution in agricultural output and became the first successful selective herbicide. It allowed for greatly enhanced weed control in wheat, maize (corn), rice, and similar cereal grass crops, because it kills dicots (broadleaf plants), but not most monocots (grasses). The low cost of 2,4-D has led to continued usage today, and it remains one of the most commonly used herbicides in the world. Like other acid herbicides, current formulations use either an amine salt (often trimethylamine) or one of many esters of the parent compound. These are easier to handle than the acid. Many modern chemical herbicides used in agriculture and gardening are specifically formulated to decompose within a short period after application. This is desirable, as it allows crops and plants to be planted afterwards, which could otherwise be affected by the herbicide. However, herbicides with low residual activity (i.e., that decompose quickly) often do not provide season-long weed control and do not ensure that weed roots are killed beneath construction and paving (and cannot emerge destructively in years to come), therefore there remains a role for weedkiller with high levels of persistence in the soil. Herbicides are classified/grouped in various ways e.g. according to the activity, timing of application, method of application, mechanism of action, chemical family. This gives rise to a considerable level of terminology related to herbicides and their use. Defoliant, similar to herbicides, but designed to remove foliage (leaves) rather than kill the plant. Residual activity: An herbicide is described as having low residual activity if it is neutralized within a short time of application (within a few weeks or months) - typically this is due to rainfall, or by reactions in the soil. An herbicide described as having high residual activity will remain potent for a long term in the soil. For some compounds, the residual activity can leave the ground almost permanently barren. Herbicides are often classified according to their site of action, because as a general rule, herbicides within the same site of action class will produce similar symptoms on susceptible plants. Classification based on site of action of herbicide is comparatively better as herbicide resistance management can be handled more properly and effectively. Classification by mechanism of action (MOA) indicates the first enzyme, protein, or biochemical step affected in the plant following application. ACCase inhibitors: Acetyl coenzyme A carboxylase (ACCase) is part of the first step of lipid synthesis. Thus, ACCase inhibitors affect cell membrane production in the meristems of the grass plant. The ACCases of grasses are sensitive to these herbicides, whereas the ACCases of dicot plants are not. EPSPS inhibitors: Enolpyruvylshikimate 3-phosphate synthase enzyme (EPSPS) is used in the synthesis of the amino acids tryptophan, phenylalanine and tyrosine. They affect grasses and dicots alike. Glyphosate (Roundup) is a systemic EPSPS inhibitor inactivated by soil contact. Most herbicides are applied as water-based sprays using ground equipment. Ground equipment varies in design, but large areas can be sprayed using self-propelled sprayers equipped with long booms, of 60 to 120 feet (18 to 37 m) with spray nozzles spaced every 20–30 inches (510–760 mm) apart. Towed, handheld, and even horse-drawn sprayers are also used. On large areas, herbicides may also at times be applied aerially using helicopters or airplanes, or through irrigation systems (known as chemigation). Herbicide volatilisation or spray drift may result in herbicide affecting neighboring fields or plants, particularly in windy conditions. Sometimes, the wrong field or plants may be sprayed due to error. Herbicides have widely variable toxicity in addition to acute toxicity arising from ingestion of a significant quantity rapidly, and chronic toxicity arising from environmental and occupational exposure over long periods. Much public suspicion of herbicides revolves around a confusion between valid statements of acute toxicity as opposed to equally valid statements of lack of chronic toxicity at the recommended levels of usage. For instance, while glyphosate formulations with tallowamine adjuvants are acutely toxic, their use was found to be uncorrelated with any health issues like cancer in a massive US Department of Health study on 90,000 members of farmer families for over a period of 23 years. That is, the study shows lack of chronic toxicity, but cannot question the herbicide's acute toxicity. Imazapic, a selective herbicide for both the pre- and postemergent control of some annual and perennial grasses and some broadleaf weeds, kills plants by inhibiting the production of branched chain amino acids ( valine, leucine, and isoleucine), which are necessary for protein synthesis and cell growth. Sodium chlorate (disused/banned in some countries), a nonselective herbicide, is considered phytotoxic to all green plant parts. It can also kill through root absorption. Several sulfonylureas, including Flazasulfuron and Metsulfuron-methyl, which act as ALS inhibitors and in some cases are taken up from the soil via the roots. Recently, the term "organic" has come to imply products used in organic farming. Under this definition, an organic herbicide is one that can be used in a farming enterprise that has been classified as organic. Depending on the application, they may be less effective than synthetic herbicides[ citation needed] and are generally used along with cultural and mechanical weed control practices. Vinegar  is effective for 5–20% solutions of acetic acid, with higher concentrations most effective, but it mainly destroys surface growth, so respraying to treat regrowth is needed. Resistant plants generally succumb when weakened by respraying. Steam has been applied commercially, but is now considered uneconomical and inadequate. It controls surface growth but not underground growth and so respraying to treat regrowth of perennials is needed. 2,4,5-Trichlorophenoxyacetic acid (2,4,5-T) was a widely used broadleaf herbicide until being phased out starting in the late 1970s. While 2,4,5-T itself is of only moderate toxicity, the manufacturing process for 2,4,5-T contaminates this chemical with trace amounts of 2,3,7,8-tetrachlorodibenzo-p-dioxin (TCDD). TCDD is extremely toxic to humans. With proper temperature control during production of 2,4,5-T, TCDD levels can be held to about .005 ppm. Before the TCDD risk was well understood, early production facilities lacked proper temperature controls. Individual batches tested later were found to have as much as 60 ppm of TCDD. 2,4,5-T was withdrawn from use in the USA in 1983, at a time of heightened public sensitivity about chemical hazards in the environment. Public concern about dioxins was high, and production and use of other (non-herbicide) chemicals potentially containing TCDD contamination was also withdrawn. These included pentachlorophenol (a wood preservative) and PCBs (mainly used as stabilizing agents in transformer oil). Some feel[ who?] that the 2,4,5-T withdrawal was not based on sound science. 2,4,5-T has since largely been replaced by dicamba and triclopyr. Agent Orange was a herbicide blend used by the British military during the Malayan Emergency and the U.S. military during the Vietnam War between January 1965 and April 1970 as a defoliant. It was a 50/50 mixture of the n-butyl esters of 2,4,5-T and 2,4-D. Because of TCDD contamination in the 2,4,5-T component,[ citation needed] it has been blamed for serious illnesses in many people who were exposed to it. Diesel, and other heavy oil derivatives, are known to be informally used at times, but are usually banned for this purpose. ^ a b c EPA. February 2011 Pesticides Industry. Sales and Usage 2006 and 2007: Market Estimates Archived 2015-03-18 at the Wayback Machine. Summary in press release here Main page for EPA reports on pesticide use is here. ^ Robbins, Paul (2007-08-27). Encyclopedia of environment and society. Robbins, Paul, 1967-, Sage Publications. Thousand Oaks. p. 862. ISBN 9781452265582. OCLC 228071686. ^ Andrew H. Cobb; John P. H. Reade (2011). "7.1". Herbicides and Plant Physiology. John Wiley & Sons. ISBN 9781444322491. ^ Robert L Zimdahl (2007). A History of Weed Science in the United States. Elsevier. ISBN 9780123815026. ^ Quastel, J. H. (1950). "2,4-Dichlorophenoxyacetic Acid (2,4-D) as a Selective Herbicide". Agricultural Control Chemicals. Advances in Chemistry. 1. pp. 244–249. doi: 10.1021/ba-1950-0001.ch045. ISBN 978-0-8412-2442-1. ^ Zhou Q, Liu W, Zhang Y, Liu KK (Oct 2007). "Action mechanisms of acetolactate synthase-inhibiting herbicides". Pesticide Biochemistry and Physiology. 89 (2): 89–96. doi: 10.1016/j.pestbp.2007.04.004. ^ a b Stryer, Lubert (1995). Biochemistry, 4th Edition. W.H. Freeman and Company. p. 670. ISBN 978-0-7167-2009-6. ^ Moran GR (Jan 2005). "4-Hydroxyphenylpyruvate dioxygenase" (PDF). Arch Biochem Biophys. 433 (1): 117–28. doi: 10.1016/j.abb.2004.08.015. PMID 15581571. Archived from the original (PDF) on 2014-03-03. ^ Krämer, Wolfgang, ed. (2012). Modern crop protection compounds (2nd, rev. and enl. ed.). Weinheim: Wiley-VCH-Verl. pp. 197–276. ISBN 978-3-527-32965-6. ^ Van Almsick, A. (2009). "New HPPD-Inhibitors – A Proven Mode of Action as a New Hope to Solve Current Weed Problems". Outlooks on Pest Management. 20: 27–30. doi: 10.1564/20feb09. ^ Lock, E. A.; Ellis, M. K.; Gaskin, P; Robinson, M; Auton, T. R.; Provan, W. M.; Smith, L. L.; Prisbylla, M. P.; Mutter, L. C.; Lee, D. L. (1998). "From toxicological problem to therapeutic use: The discovery of the mode of action of 2-(2-nitro-4-trifluoromethylbenzoyl)-1,3-cyclohexanedione (NTBC), its toxicology and development as a drug". Journal of Inherited Metabolic Disease. 21 (5): 498–506. doi: 10.1023/A:1005458703363. PMID 9728330. ^ "PROTECTING CROP YIELDS AND QUALITY WORLDWIDE". ^ "Weed Science Society of America". ^ a b Retzinger Jr, E. J.; Mallory-Smith, C. (1997). "Classification of herbicides by site of action for weed resistance management strategies". Weed Technology. 11: 384–393. ^ Schmidt, R. R. (1997). "HRAC classification of herbicides according to mode of action". 1997 Brighton crop protection conference: weeds. Proceedings of an international conference, Brighton, UK, 17–20 November 1997, British Crop Protection Council. pp. 1133–1140. ^ Mallory-Smith, C. (1999). "Impact of labeling herbicides by site of action: A University view". Weed Technology. 13: 662. ^ a b c d Forouzesh, Abed; Zand, Eskandar; Soufizadeh, Saeid; Samadi Foroushani, Sadegh (2015). "Classification of herbicides according to chemical family for weed resistance management strategies–an update". Weed Research. 55 (4): 334–358. doi: 10.1111/wre.12153. ^ a b Beckie, H. J.; Harker, L. M.; Hall, S. I.; et al. (2006). "A decade of herbicide-resistant crops in Canada". Canadian Journal of Plant Science. 86 (4): 1243–1264. doi: 10.4141/P05-193. 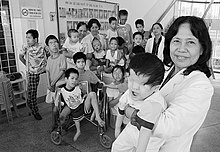 ^ "The legacy of Agent Orange". BBC News. 29 April 2005. ^ "Agent Orange's Long Legacy, for Vietnam and Veterans". nytimes.com. ^ Andreotti, Gabriella; Koutros, Stella; Hofmann, Jonathan N; Sandler, Dale P; Lubin, Jay H; Lynch, Charles F; Lerro, Catherine C; De Roos, Anneclaire J; Parks, Christine G; Alavanja, Michael C; Silverman, Debra T; Beane Freeman, Laura E (2018). "Glyphosate Use and Cancer Incidence in the Agricultural Health Study". JNCI Journal of the National Cancer Institute. 110 (5): 509–516. doi: 10.1093/jnci/djx233. PMID 29136183. ^ Smith (18 July 1995). "8: Fate of herbicides in the environment". Handbook of Weed Management Systems. CRC Press. pp. 245–278. ISBN 978-0-8247-9547-4. ^ "Facts About Herbicide - Department Of Veterans Affairs". Retrieved September 1, 2016. ^ Kogevinas, M; Becher, H; Benn, T; et al. (1997). "Cancer mortality in workers exposed to phenoxy herbicides, chlorophenols, and dioxins. An expanded and updated international cohort study". American Journal of Epidemiology. 145 (12): 1061–75. doi: 10.1093/oxfordjournals.aje.a009069. PMID 9199536. ^ Kettles, MK; Browning, SR; Prince, TS; Horstman, SW (1997). "Triazine herbicide exposure and breast cancer incidence: An ecologic study of Kentucky counties". Environmental Health Perspectives. 105 (11): 1222–7. doi: 10.1289/ehp.971051222. PMC 1470339. PMID 9370519. ^ Talbot, AR; Shiaw, MH; Huang, JS; Yang, SF; Goo, TS; Wang, SH; Chen, CL; Sanford, TR (1991). "Acute poisoning with a glyphosate-surfactant herbicide ('Roundup'): A review of 93 cases". Human & Experimental Toxicology. 10 (1): 1–8. doi: 10.1177/096032719101000101. PMID 1673618. ^ Reuber, MD (1981). "Carcinogenicity of Picloram". Journal of Toxicology and Environmental Health. 7 (2): 207–222. doi: 10.1080/15287398109529973. PMID 7014921. ^ Gorell, JM; Johnson, CC; Rybicki, BA; Peterson, EL; Richardson, RJ (1998). "The risk of Parkinson's disease with exposure to pesticides, farming, well water, and rural living". Neurology. 50 (5): 1346–50. doi: 10.1212/WNL.50.5.1346. PMID 9595985. ^ Dinis-Oliveira, R.J.; Remião, F.; Carmo, H.; Duarte, J.A. ; Navarro, A. Sánchez; Bastos, M.L. ; Carvalho, F. (2006). "Paraquat exposure as an etiological factor of Parkinson's disease". NeuroToxicology. 27 (6): 1110–22. doi: 10.1016/j.neuro.2006.05.012. PMID 16815551. ^ Blus, Lawrence J.; Henny, Charles J. (1997). "Field Studies on Pesticides and Birds: Unexpected and Unique Relations". Ecological Applications. 7 (4): 1125–1132. doi: 10.1890/1051-0761(1997)007[1125:FSOPAB]2.0.CO;2. ^ MacKinnon, D. S.; Freedman, B. (1993). "Effects of Silvicultural Use of the Herbicide Glyphosate on Breeding Birds of Regenerating Clearcuts in Nova Scotia, Canada". Journal of Applied Ecology. 30 (3): 395–406. doi: 10.2307/2404181. JSTOR 2404181. ^ Newton, Ian (2004). "The recent declines of farmland bird populations in Britain: An appraisal of causal factors and conservation actions". Ibis. 146 (4): 579–600. doi: 10.1111/j.1474-919X.2004.00375.x. ^ Hayes, T. B.; Collins, A.; Lee, M.; Mendoza, M.; Noriega, N.; Stuart, A. A.; Vonk, A. (2002). "Hermaphroditic, demasculinized frogs after exposure to the herbicide atrazine at low ecologically relevant doses". Proceedings of the National Academy of Sciences. 99 (8): 5476–80. Bibcode: 2002PNAS...99.5476H. doi: 10.1073/pnas.082121499. PMC 122794. PMID 11960004. ^ Ibrahim MA, Bond GG, Burke TA, Cole P, Dost FN, Enterline PE, Gough M, Greenberg RS, Halperin WE, McConnell E, et al. (1991). "Weight of the evidence on the human carcinogenicity of 2,4-D". Environ Health Perspect. 96: 213–222. doi: 10.1289/ehp.9196213. PMC 1568222. PMID 1820267. ^ Howard I. Morrison; Kathryn Wilkins; Robert Semenciw; Yang Mao; Don Wigle (1992). "Herbicides and Cancer". Journal of the National Cancer Institute. 84 (24): 1866–1874. doi: 10.1093/jnci/84.24.1866. PMID 1460670. ^ Gilbert, Scott F (2010). Developmental Biology (9th ed.). Sinauer Associates. p. [ page needed]. ISBN 978-0-87893-384-6. ^ Marking, Syl (January 1, 2002) "Marestail Jumps Glyphosate Fence" Archived 2009-07-10 at the Wayback Machine, Corn and Soybean Digest. ^ a b c d Service, R. F. (2013). "What Happens when Weed Killers Stop Killing?". Science. 341 (6152): 1329. doi: 10.1126/science.341.6152.1329. PMID 24052282. ^ Powles, S.B. ; Yu, Q. (2010). "Evolution in action: plants resistant to herbicides". Annual Review of Plant Biology. 61: 317–347. doi: 10.1146/annurev-arplant-042809-112119. PMID 20192743. ^ Alberto, Diana; Serra, Anne-Antonella; Sulmon, Cécile; Gouesbet, Gwenola; Couée, Ivan (2016). "Herbicide-related signaling in plants reveals novel insights for herbicide use strategies, environmental risk assessment and global change assessment challenges". Science of the Total Environment. 569-570: 1618–1628. Bibcode: 2016ScTEn.569.1618A. doi: 10.1016/j.scitotenv.2016.06.064. PMID 27318518. ^ a b c d e Moss, S. R. (2002). "Herbicide-Resistant Weeds". In Naylor,, R. E. L. Weed management handbook (9th ed.). Blackwell Science Ltd. pp. 225–252. ISBN 978-0-632-05732-0. ^ a b c Stokstad, E. (2013). "The War Against Weeds Down Under". Science. 341 (6147): 734–736. doi: 10.1126/science.341.6147.734. PMID 23950526. ^ IMAZAMOX | Pacific Northwest Weed Management Handbook Archived 2012-06-25 at the Wayback Machine. Pnwhandbooks.org. Retrieved 2013-03-05. ^ McDade, Melissa C.; Christians, Nick E. (2009). "Corn gluten meal—a natural preemergence herbicide: Effect on vegetable seedling survival and weed cover". American Journal of Alternative Agriculture. 15 (4): 189. doi: 10.1017/S0889189300008778. ^ Kolberg, Robert L.; Lori J. Wiles (2002). "Effect of Steam Application on Cropland Weeds1". Weed Technology. 16: 43–49. doi: 10.1614/0890-037X(2002)016[0043:EOSAOC]2.0.CO;2. ^ LEARN HOW TO BEGIN A SUCCESSFUL ORGANIC PEST CONTROL OPERATION IN GARDENS, GROVES, FIELDS AND ORCHARDS. p. 1880. 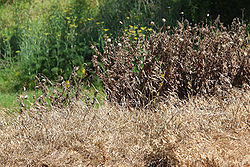 Wikimedia Commons has media related to Herbicides.